If you suffer from Rosacea or wonder if you have Rosacea, please read my story HERE. “Just when I would think I had it under control, the redness came back again — and again. After everything seemed to calm down and my skin finally recovered from a flare-up, I still had that “extra pink” color on my face. I tried to convince myself that it didn’t look so bad… I was fooling myself. For some, this cycle becomes so frustrating that they “curse the mirror” and pray for some sort of miracle. I’ve tried various treatments over the years to try and control my Rosacea. My dermatologist thought I was questioning his credentials when I asked why nothing he offered was working. Finally, I just accepted my condition and did my best not to trigger flare-ups. That’s all I could do. The treatment worked right away to tone my flare ups. By the second day I KNEW it was working. After the first week my face was clear. It was amazing because at that point I realized that I had, over time, come to accept my face to be a certain way. I realized I’d been looking at myself through a “lens” all these years. I’m extremely thankful I found ZENMED. If you’re tired of trying this and that solution, go with ZENMED first. Hello, my right side of my face has rosacea and it does turn red in the sun and when i do drink and eat certain food… also breaking out alot, i nevered break out as much as i do now.. I just ordered Zenmed for oily Skin .. How long did you use it for and did it worked immediately? OMG, i know how exactly you feel, i am 15 yrs old now and im so red….they said i would never get rid of it..i might look into the ZENMED.. When it was finally gone, I was in denial because I was expecting it to come back… 🙂 Yes, it helped right away. 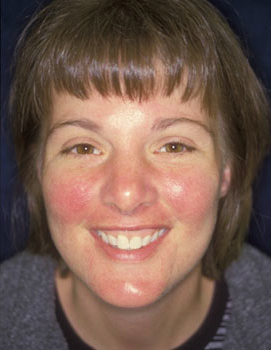 Rosacea treatment options are not one-size-fits-all. Check with your doctor, but don’t be afraid to experiment with lifestyle changes. I’ve also tried many products but none of them worked. Been hearing a lot about this Zenmed stuff, about how good it is, etc. I think I’ll give it a try. Thanks for sharing your story.